May 25th, 2011 was a Wednesday like any other. Except it wasn’t. In a small corner of the internet, 51allout was born. Oprah Winfrey, sensing a changing of the guard creeping up behind her like Michael Holding in full flight, promptly broadcasted her last ever show. The two-part show featured appearances by Aretha Franklin, Tom Cruise, Stevie Wonder, Beyoncé, Tom Hanks, Maria Shriver, Will Smith and Madonna. This was seriously annoying for those of us in charge of the 51allout launch party as all eight of those guests turned down our invitations. 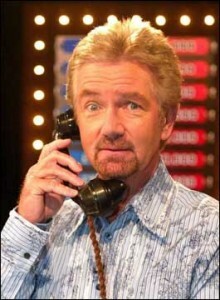 At least they did so politely; Noel Edmonds sent us an obscene letter in green ink, leading to a year-long public feud. We started in cosy surroundings over at Blogspot, where we spent two months writing mostly matter-of-fact articles and growing beards in an attempt to be taken seriously. When that failed to work (the being taken seriously bit – the beards worked out brilliantly) we moved to our current location and started to let our hair down a little, occasionally mentioning gin and cramming cultural references into live blogs of England’s T20 games. What have been your cricketing highlights of the last twelve months? Matt H: I can’t pinpoint one particular moment, cricketwise, so I suppose my highlight is a combination of England’s attitude and strength in depth. Compare the cricketers with the English rugby union and football teams: these players (generally…) seem likeable, humourous, well-spoken, polite and perform together as a squad. And talking of the squad, the way that the players like Bresnan, Finn and Tremlett perform admirably when called upon, but remain positive when on the sidelines, speaks volumes about the England set-up. See also the performance squad and the queue of fine young fast bowlers waiting for their chance. Cricketers we can be mostly be very proud of. James K: The utter destruction of India was enjoyable, but the most exciting matches have probably not involved England. Australia’s whistle-stop tour of South Africa was good to watch, particularly the 21/9 game. New Zealand rolling the Australians in Hobart to win a really close one was great fun too. There’s a bit of a theme developing here… But KP’s ridiculous innings in Colombo and Stuart Broad’s hat-trick are probably the two stand out moments, though. Actually, thinking about it, one of the things that really sticks in the mind was watching Michael Clarke’s innings when he got 300 and it genuinely felt like he might go on and break the record. I remember being incredibly annoyed that I’d stayed up most of the night just in case and then he declared on himself. NB: I agree about those Australian results – they’ve been fascinating to watch as they’ve lurched from being a shambles to looking half-decent and back again, often in the course of a day. Along similar lines, I like how we’ve come to love Steve Smith like an adopted son, despite the fact that we basically set the site up to publically abuse him. He still wouldn’t retweet us though, the cheeky scamp. A definite lowlight: India. They were an absolute shower in England last summer and they were even worse in Australia. In particular, the Test at the WACA was just horrific, with village idiot Dave Warner teeing off and the game nearly finishing inside two days. Matt L: I think the highlight for me was Kohli’s innings against Sri Lanka in Tasmania. India had been universally written off at that point, and although it was ultimately fruitless in terms of qualifying them for the finals, it was one of the most audacious innings I have seen in a long time, and proof, perhaps, that for Kohli at least the hype may be justified. On a personal note though I had immense fun in watching Saeed Ajmal annihilate the vaunted English top order with his distinctive brand of non-spinning spinners. 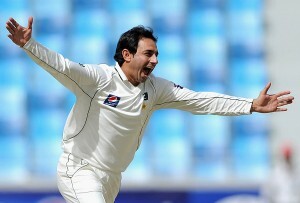 Saeed Ajmal: definitely not invited to our party. Gratuitous self-promotion time: which have been your favourite articles of the last twelve months, both to read and to write? MH: The one where we used a picture of a naked Chris Tremlett. The one where we used a picture of a naked Noel Edmonds, which sadly Steve’s lawyer wouldn’t let us publish. And if I’m honest, the ones that have been provided by our overseas correspondents. It has been illuminating reading the views of an Australian about their prospective players; Arjun’s moist-eyed retrospective look at the 2001 India vs. Austalia series was equally fascinating. From the ones I’ve written? Well, I’ve rediscovered the delights of gin and to be honest, the delights of gin came in very handy when trying to research the biographies of eleven cricketers for our X XI (that’s X eleven, not 21). JK: Though we generally go for the quantity over quality approach, I think the Classic Series review pieces have been some of our better moments. The one Matt mentioned plus his own look at the 1992 World Cup were good reads but personally I think the series review of England vs West Indies in 1991 is probably the best of all. Some of the Alphabet sides have been enjoyable to put together. I managed to cunningly get to do a few of the better ones and the W XI was especially good. I like doing the live-blogs too; the chaotic nature of trying to successfully work the internet, someone inevitably messing up the rota and T20 in general is an entertaining mix. NB: I’ve been really chuffed with the general standard of articles that we’ve produced, considering that none of us (bar Steve) have got any real idea of what we’re doing. As James mentioned, Matt H’s review of the 1992 World Cup was great. I think a lot of the ‘day to day’ reviews and stuff have been really good as well. From a personal point of view, I think the Commonwealth Bank series reviews were probably my favourites to write, mainly because I don’t think anybody read them at the time, basically giving me free reign to talk about Channel 9’s commentary team and Noel Edmonds. ML: I have never understood the mystifying beast that is the IPL, so articles like this one have been able to provide a great deal of insight. I guess it just goes to show that you should never underestimate the ability of a deranged mind to interpret the incomprehensible. I did enjoy doing the live blog’s of Pune games though. Trawling through the mountains of abuse on the Youtube feed, spilling gin all over the place everytime Steve Smith appeared, and just generally talking nonsense in an attempt to sound knowledgable. On that form I will be taking Danny Morrison’s job next. 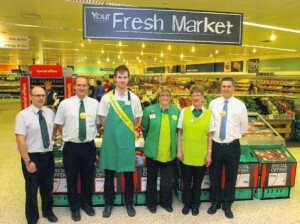 Matt L shows off his employee of the week sash. And what do the next twelve months have in store for us? NB: One word: podcast. At some point we’ll just have to bite the bullet and produce one. God help whichever poor soul has to edit 90 minutes of discussion about Mark Ealham into something coherent. At least it’ll give us the opportunity to discuss a better way of distinguishing between Jonny Bairstow and Jos Buttler than Matt H’s previous JB(i) and JB(ii) system. On the pitch I think England will beat the West Indies and South Africa at home and, more controversially, India away. I don’t think they’ll win the world T20 though. By the time the next Ashes starts England and Australia will be the top two sides in the world, leading to absurd levels of hype for the back-to-back Ashes series. ML: Yeah, not really looking forward to that; from the Australian A tour in July onwards it’s going to be about twelve months straight of Ashes hype, which will probably burst sometime after we slump to 28/5 on the first morning at Lord’s. Personally I’m looking forward to seeing where Bangladesh go from here. They seem to have manoeuvred into their usual ‘on the cusp of breaking through’ position, which is normally followed by a complete collapse. If they can get a good successor to Stuart Law, they might just make the step up this time. I’m also looking forward to the installation of that life sized solid porphyry statue of Steve Smith in the 51allout foyer. Should brighten things up considerably more than the piles of Michael Atherton’s autobiography that are currently cluttering up the place. JK: Mr Bluth has been harping on about a podcast for months now. Once we can work out how to solve the logistical difficulties of having a group of people thousands of miles apart get together it’ll be time to take the plunge. I’m far less optimistic about England; they’ll have no problem dispatching the West Indies but I fancy a drawn series with South Africa and can’t see them beating India away. I think South Africa will be the top side in the world by the end of the year, but their tour to Australia will be an excellent indicator of where the latter are going into the Ashes. I’m not taken at all with all this talk of a resurgence – India were hopeless over Christmas and the West Indies just aren’t very good. I’m still holding out for a 10-0 win. MH: I’m going to find out exactly what paucity means. On the cricketing front meanwhile, we’ve some huge series coming up and I think only after both (South Africa at home, India away) will we be able to really understand how great (or not) this England side is. As for 51allout? Well I think we’ll become even more pan-continental by having further input from our occaisional contributers resident in Africa and Asia. I’m pretty sure you were invited – you probably just couldn’t see the message due to your reluctance to use a browser other than Netscape Navigator. Sorry, which one are you again? I didn’t get invited to this discussion. For shame.